The SAILOR 900 VSAT Ka is the world’s most advanced and reliable 3-axis stabilized Ka-band antenna system for the Telenor THOR 7 satellite network. It’s unique design and technology streamlines the deployment process, introducing significant installation benefits. While in operation, SAILOR 900 VSAT Ka enables service providers to deliver unmatched reliability and link uptime. The game-changing operational and installation attributes of the SAILOR 900 VSAT Ka are made possible through the power of the proven SAILOR VSAT technology platform. Highly regarded by satcom service providers worldwide, the ease-of-use, quick deployment and reliable operation enabled by SAILOR VSAT technology has created a new industry standard. SAILOR 900 VSAT Ka is built to withstand the toughest sea conditions and still deliver high bandwidth connectivity. It is the fastest tracking antenna available, with superior dynamic performance in all axes; roll, pitch and yaw. This high performance means that even smaller vessels more affected by rough seas can make the most of THOR 7 services. Advanced SAILOR VSAT technology antenna systems like SAILOR 900 VSAT Ka completely simplify the once complex process of VSAT antenna procurement and installation. This saves time and money. 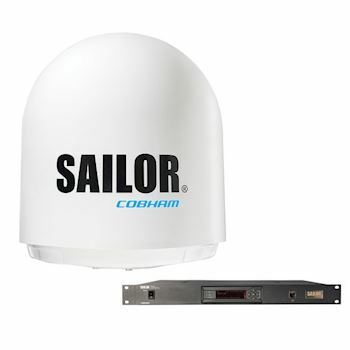 Cobham SATCOM has achieved this revolution not through a single design breakthrough, but with a wealth of features and details unique to the SAILOR VSAT technology platform. For instance, a single cable between antenna and below deck equipment for RF, power and data combined with Automatic Azimuth Calibration and Automatic Cable Calibration enable unique ‘One touch commissioning’. Dynamic Motor Brakes inside the antenna remove the requirement for mechanical brake straps, ensuring the antenna is kept in balance during no-power situations at sea or in transport.